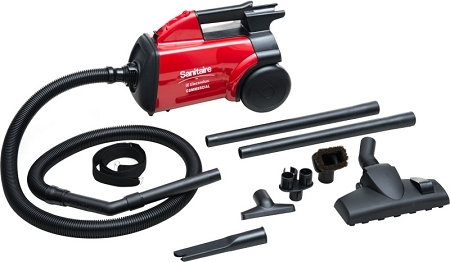 Our proven Sanitaire canister SC3683B is compact, lightweight, powerful and features a 2-piece plastic wand to reach those difficult cleaning locations and available HEPA filtration make this the perfect detail cleaner. From bare floors and low-pile carpeting to above-the-floor cleaning, this multi-use canister is perfect for all your multi-surface cleaning jobs. I have been buying the Mighty Mite since 2010.I usually order about 3 a year. I use it every day as I have a cleaning business.I have referred this item to many people since it has always been top of the line. That has changed for me.The last two purchases I have made with Amazon have been very disappointing.So much so that I will never be purchasing another one of your vacuums. The suction on the last two purchases is obvious that you have looked to save costs. There is such a huge difference in the product I use to buy compared with what I have received the last two times. The suction on the last two orders was terrible. Noticeably different. I have to go over the floor multiple times to get everything up. Also the motor is much louder than previously. I own and operate a boarding kennel. Before discovering the Sanitaire, the staff broke 2-3 vacuums a year. These units do the job and hold up to abuse. I am embarrassed to admit that the company I work for buys this item. Used to be an OK vac but the last couple of shipments we noticed changes in the pole/ hose, which had been metal but now is plastic and really flimsy, doesn't hold up for what we need it to. The head wears down really fast and the suction isn't very good at all. I love this vacuum!I have a cleaning business, and this vacuum works great! Its lite weight so you can do stairs and furniture. It picks up great!! Excellent vacuum. Very light weight . Pick up everything . Q: What Baggs should I order for this vacuum ? Q: Is this a discontinued product? If so, will I be able to get bags? A: The last package I saw it was still standard. They are going through changes on that part. Q: Where to install the HEPA filter for this vacuum? A: It will attach at the rear end of the vacuum where the exhaust is. 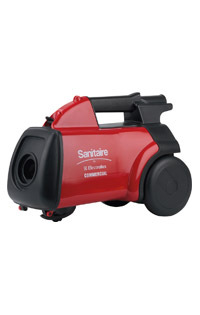 Q: I have a new SC3683B Sanitaire vacuum, can I add a HEPA filter and motor filter to this model, if so, how? How can I order that without ordering the vacuum? Thanks. A: Yes you can. it will be part number 60666B.